I am regressing back in time as I come across old letters of acceptance for my cartoons. It also reminds me about how long I have been “slinging the ink” so to speak since I see some early letters dating back to the mid 1970’s. Unbelievable seeing how receptive trade journal cartoons were, since so many specialized publications used cartoons then. I’m not saying this isn’t the case right now. I haven’t really sought out new potential markets for my cartoons like I had done in the past. There seems to be so many other potential areas in which cartoonists can offer their work and services. Especially now with the proliferation of the internet and the potential it offers to those cartoonists, humorous illustrators and others who seek to take advantage of the medium! 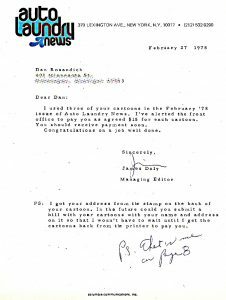 I look at these acceptance letters from editors like Jim Daly at Auto Laundry News and realize how our talents can also morph into other offerings in the field of cartooning. It was Jim who saw enough potential in me, that he also offered to have me illustrate actual articles or content in the publication. For a young cartoonist, these assignments are “gravy” since you’re actually working directly, one on one with the editor and I felt it was a privilege to work in this capacity. 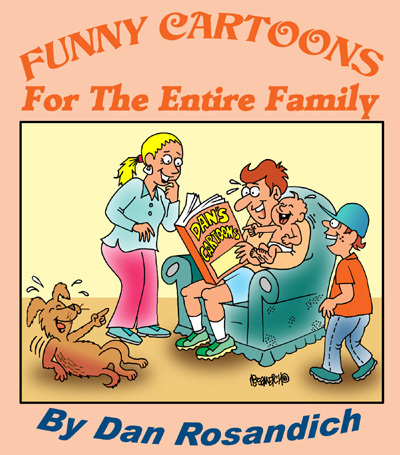 Not only was I creating single panel cartoons and submitting them on spec, but that same editor had enough faith in me to give me work by assigning me humorous illustrations to create for his magazine. I do recall Jim and I negotiated a higher rate for those custom cartoons he used, and keep in mind, in those days, I didn’t even use a fax machine yet! Jim was so easy to work with and literally what I drew, I’d mail him or send it via ‘Priority Mail’ and 98% of the time, he liked the final outcome and we worked this way for quite some time. 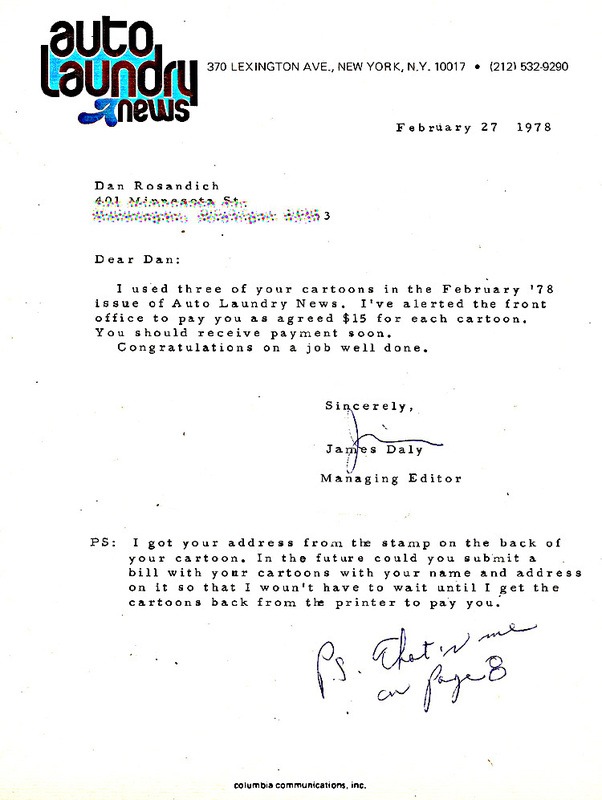 I also used that experience as a part of my portfolio expertise in future promotional efforts to other editors. I’d make up brochures and put those previously published samples on those brochures and send them out to new prospects who saw this, and hired me. So, for any budding cartoonist, keep your hopes high, invest time with new editors or creative directors and offer to take direction from them. You can use that previous experience at a later date, to your own advantage.